In India oven is not available in all houses, for them this is a good way to prepare cake in home without Oven. I am sure that your children's will like this cake very much. try this cake and give your feedback to us. 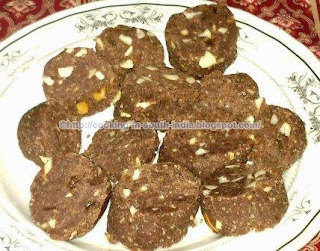 let us see how to prepare simple Chocolate Cashew Cake Without Oven in quick period of time. Take 20 to 30 Marie biscuits and powder the biscuits in a mixer-grinder. I choose Marie biscuit because sweet is less. now in a bowl add Cashews and Almond which broken into small pieces with powdered biscuits then add Cocoa powder, Vanilla essence, condensed milk and Powdered sugar. finally add slightly melted butter little by little in the dough and mix well and keep in refrigerator for 15 minutes. Divide the dough into small rounded pieces and refrigerated for an hour before serve. can I use the normal milk(which we use for drinking) instead of condensed?